Often I get questions from customers that how I could detect if there are any configuration setting missing to work with different browser in Test Studio. This can be easily detected. Very first before you start working with Test Studio in different browsers make sure you have configured them. 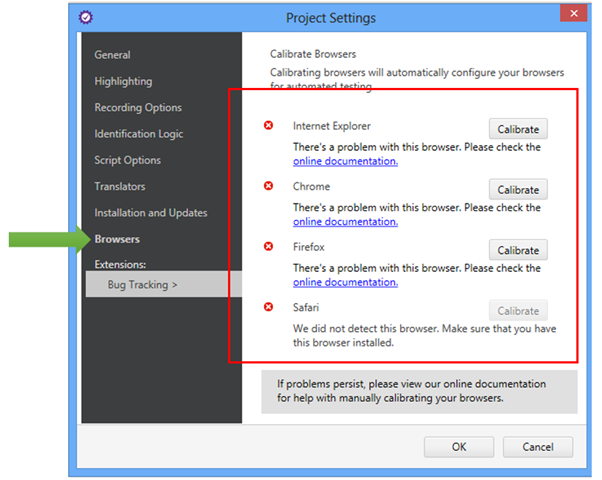 After installation you can detect browsers or configured or not in Project Setting. 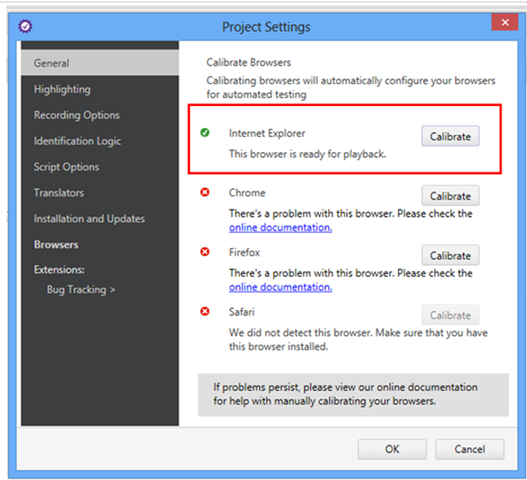 You have option to calibrate browser right from there. You will get message to close instance. In this way you can detect configuration setting of browsers to work with Test Studio. I hope you find this post useful. Thanks for reading. Q: Are these native apps we are talking about? Q: Can we use Express Edition to practice this? Q: Can we practice it on any other ide other than VS or is it only for it? A: The webinar featured a extension we have for Visual Studio. But Icenium comes as a stand alone IDE also. We have Windows Client called Icenium Graphite or you can use Icenium on the browser itself. Currently supported only on Chrome. Q: For android development with visual studio can we do it without any explicit plugin? Q: How difficult/easy it is to design my app once, and create ios application and android application PARALLELY? A: With Icenium and Kendo UI Mobile controls, you write your code only once. Icenium lets you build packages for Android and iOS right within Icenium. Kendo UI Mobile controls provide you the adaptive rendering capability i.e. Kendo UI Mobile controls adapt to platform they are running on and give you native look and feel. Q: Can the jQuery version file be changed at any time? Q: Is Icenium different from Kendo control set ? Q: Will Icenium Support design and development of Web Services or the same will have to be developed seperately in .NET? Q: Is Icenium an opensource? A: No. Icenium is licensed product. It is per developer subscription based. Q: Since iOS 7 is released, how do we set the version to 7.0 in iOS simulator? A:. Work is under way. We will update the simulator once we are ready. In fact we already have a flat theme in Kendo UI Mobile control set from past year or so. So you already have a flat theme to apply to your apps. Q: Which Visual Studio version we are going to discuss to achieve this? A: Icenium Extension for Visual Studio supports only Visual Studio 2012 at the moment. Q: Can we run tis apps on windows phone 8 also? A: Yes. But Icenium cannot make the package for you. You will need to copy the complete source code. use Windows Phone project template for HTML5 and dump your code. Then create the XAP file and put it to market place. Q: this will be compatible with all device of Android and iPhone? A: Yes. Icenium also provides adaptive rendering for individual platform. Q: Only VS 2012 is enough or do we need to install any plugins? A: You will need to install Icenium Extension for Visual Studio from Visual Studio Gallery. Q: From where can we download Icenium Plugin? We already have a license of telerik, do we need to buy a separate one? A: You can download the Icenium extension from Visual Studio Gallery. You can develop an app and test in Icenium simulator. But when it comes to packaging you will need to buy Icenium subscription which is per developer and on monthly basis. Q: Can we deploy directly to physical phone if its connected ? A: Yes, you will be able to. LiveSync enables immidiate sync to all devices attached to the machine. A: No direct migration from Silverlight to Icenium. Q: Can we access hardware including Camera, GPS and other sensors? A: Yes, via the cordova library. Part of Icenium. Q: I have a Kendo app (browser app) can we migrate it to Icenium? A: Kendo Browser Apps using Kendo UI Web controls which is meant for running on desktop browsers. For mobile, we recommend using Kendo UI Mobile controls. A: Yes, the trials are fully featured trials. A: WP is supported by a slightly different procedure. Please write to sales@telerikindia.com in case you would like to explore this further. A: Yes, via the plugin architecture. A: Sorry, Icenium can only build mobile apps. A: There are known as “data-“ attributes in HTML5 specification. HTML 5 makes provision for it. Icenium makes it functional. Q: Can we get a trial version of Icenium? Q: We need to know how to use ListView and how to bind a data to listview practically? A: Please write to sales@telerikindia.com and we will help you specifically. Q: Any support for Native mobile application? Q: Is this a stand-alone or web based Mobille App? A: This is being like a web based app. Upon compilation/ build it will become a stand alone app (apk/ipa) that can be put on respective app stores. Q: Just to confirm the support for ODATA using these controls? Q: Will a single code will work for both IOs and Android? A: Yes, it will. that’s magical, isn’t it? Q: Any ETA to remove this BETA ? A: Icenium is a live app (not in BETA). The VS plugins is in BETA. Q: Can we use VS2012 to write Objective C code using Icenium? A: No. This is not possible. Q: Will kendo ui mobile and jQuery mobile work together? A: There is nothing that prevents jQuery Mobile from working with Kendo UI. However, it is needless as most capabilities are available in Kendo UI. Q: is it support local database ie sqllite etc ? A: Yes. Icenium has support for SQLite plugin which can be included in your project. Q: How Icenium plugin is aligned with iphone/android/windowsPhone design elements ? A: Icenium is just the IDE for developing Hybrid Mobile Apps. It’s the Kendo UI Mobile control set which adheres to design principles of the Mobile Platform and render the controls accordingly. Q: do you have icenium extention for Eclipse/JBuilder/IntelliJ.? Q: How we can publish our app for iOS? A: Publishing for Apple Store is directly supported from Icenium. No need for a Mac. Q: To publish a app in Apple store, I need a mac device & Xcode? A: You will be excited to know that Icenium supports deployment to Apple Store directly. so, you don’t need a Mac or XCode for publishing. You can develop and deploy completely without the need for a Mac. A: Yes, Kendo is the magic behind support for different platforms/ form factors. A: sorry not supported by Icenium. Q: What is LiveSync – is it a part of kendo ui? A: LiveSync. A dedicated video: http://www.icenium.com/resources/videos-demos/video/icenium-device-simulator-and-livesync This allows the apps to be updated automatically once the change is made to the code in Icenium. No deployment needed! Q: An important question: What is % degrade in performance using Kendo UI v/s native html/css apps ? Q: Is there a support for Java IDE? Q: How much is for Licenced Icenium? A: it is a Single Page app :). However, we support browsing to other pages and hence you can have code in another page as well. Q: What is the part of ASP.Net MVC in kendo UI? Q: Did you develop the KENDO framework by your own? Q: Where can I get the help related to Kendo UI? Q: Can We Use Web Services in Icenium? A: Yes, we support REST/ OData services. Q: Can I create ASP.NET MVC4 project, where I build views using cshtml files, however use the Kendo UI controls on views ? A: Absolutely. You can use Kendo UI Web controls for serving to desktop browsers. You can develop .mobile.cshtml files and use Kendo UI Mobile controls. Q: As you told like look and feel vary between android and iOS devices .. but if I want to make theme consistant across all platform what I will have to do? A: You can use our Flat theme which gives consistent theme across all the platforms. Otherwise you can always use our Theme Builder and build your own theme. Q: Can we write custom plugin to ICENIUM like we can do in Cordova? A: Yes. Icenium allows you to import custom plugins too. Q: Instead of using emulators, can we test the app on real mobile w/o submitting it to store? Q: How we can use Kendo Ui for WP8 ? A: Quickly, you got to use the PhoneGap template in VS. Insert the Kendo UI files in WWW folder. Compile the project to get WP8 app. Congratulations to the winners. Our office will contact you for your details and we will ship your t-shirts. For those of you who are felling sad about not winning, well try your luck next time by attending our next webinar on Oct 31. Till next time, Happy coding! Read :How to debug a Coded Step in Test Studio? Mobile apps have mostly meant games and a few more utility apps. While this is a large section of the mobile app ecosystem, there is a potentially lucrative market waking up now to the possibilities of mobile apps – The Enterprise. The enterprise mobility requires a different set of considerations than the consumer oriented mobile apps. While in-app ads, mobile commerce, frame rates, access to a RadBackend (or mBaas) may be important for consumer apps, the enterprise looks for value elsewhere. For long enterprises have controlled the hardware and the software that is allowed within its premises for reasons of security, resource optimization and IT management. These days employees are getting their own mobile devices into the enterprise leading to a more heterogeneous environment. A story that illustrates this is about an enterprise that adopted WiFi to make it easy for employees to work on their laptops anywhere in the building. The load was calculated keeping in mind the number of laptops in the organisation (a decent assumption). The infrastructure collapsed within a week of it launching. On investigation, the IT realized that the devices logging into the WiFi system were more than double of what was planned for. The sneaky addition was the mobile devices of the employees (outnumbering the laptops easily)! 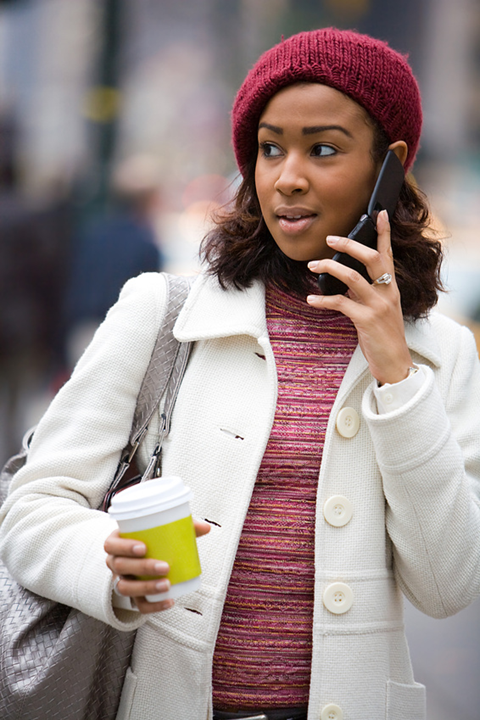 The BYOD trend can saddle an enterprise with multiple platforms – Android, iOS, Windows Phone & BlackBerry. Add to it the complexity of different form factors for each platform. The mobile apps need to accommodate and embrace this heterogeneity. A lot of infrastructure is in production in an enterprise. This may include the LAN architecture and the servers in use. The enterprises will need to add WiFi infrastructure and provision for the additional load on the IT servers by the way of mobile. With mobility, users will also want to access data from outside the corporate network. The organisation may need to revisit its IT policies to allow data access from outside corporate network. The enterprise first needs think about securing the mobile devices though policies (e.g. password, retention). An investment needs to be made in the device management software allowing for capabilities like platform upgrades, remote wipe/lockout. The next step is to plan user authentication via the mobile apps. Mobile apps are thick clients and need a different authentication mechanism(s) than currently used. Extending LDAP or ADFS infrastructure becomes necessary here. Apart from authentication, one needs to consider authorization in the mobile apps. Consider the nightmarish scenario of HR deptt accessing sales apps and employees accessing executive dashboards. IT has become the backbone of the modern enterprise. Various business applications (e.g. SAP, Oracle, Salesforce, SharePoint) are driving the everyday business processes. Mobile devices require a different set of endpoints to be exposed (namely webservices). The enterprise needs to consider the extensibility of the apps to accommodate this requirement. The mobile app ecosystems are tightly controlled by the platform vendors. The devices are only allowed to download apps from the “official” marketplaces of the devices. This leads to exposure of apps meant for the employees of the organisation to the masses. This risk can be mitigated by integrating secure login into the application. Another option is to deploy an enterprise app store working with the platform vendors. This option may be more expensive and resource intensive (think registering devices in the app stores). The enterprise needs to make a decision on the the development technology and the tool of choice. Today, the options exist between Native Development or Hybrid Development. Hybrid development offers a host of benefits including reuse of existing skills, cross platform development and lower hardware requirements for mobile app development. Equally important things to consider would be requirements, configuration, bug and release management for the application development phase. The mobile apps should perform as per expectations. Having a good quality team to whet the quality of the initial release is very important. Even more important is to have an automated process in place to verify each app release meets the quality bar of the organization. This is an area that hasn’t been paid much attention to but would pay tremendously if included in the mobile app. Knowing the features of apps that are most widely used allows the enterprise on developing those features further. Also, knowing the detailed crash reports help to pinpoint the buggy sections of the code improving the reliability of the apps. This is one non-functional requirement that takes special meaning in the mobile app scenarios. Since the mobile app works in the sometimes disconnected environment, it is important to have some offline way of caching data. One needs to take care of the scenario where the server may not be available at intermediate times. Even at these times, the mobile app should provide some critical functionalities to the users. While mBaaS services are in vogue today, they have limited value for the enterprises. The main challenge is that mBaaS are public cloud services. An enterprise may be reluctant to host its data in a public cloud due to security considerations. In addition to file and data storage, mBaaS services may also provide notification services, geolocation services, login services, digital wallets, audience segmentation and device management capabilities. The enterprise may consider mBaaS services if they require any of the above services. How to debug a Coded Step in Test Studio? Recently in one of the customer interaction I came across a question that how a Coded Step in Test Studio can be debugged? This is an important query and can be very useful while writing complex Coded Step. As we see step 6 is a Coded Step. We need to debug this step. To being with we cannot debug a particular line of coded step in Test Studio desktop version. In Test Studio desktop version we can put breakpoint to debug only at Test Step level. So we can put a breakpoint on Test Step as given below. Test Studio will wait for user at step 3, 4 and 6. Putting breakpoint at Test Step level is simple. However our requirement is to debug particular line of code in Coded Step. We cannot do this in Test Studio Desktop version. But this can be done in Test Studio plug-in of Visual Studio. So we need to follow below steps to debug coded step. After this open Test Explorer. To open it from menu select Test and then Windows and then Test Explorer. See the image below for reference. Now on debugging of that particular test you will find breakpoint is being hit. We learnt it is super easy to debug a codes step in Test Studio. I hope you find this post useful. Thanks for reading. In this video we will learn to create Android App in Visual Studio using Icenium extension. I hope you find this video useful. Thanks for watching. As you can see the initialization script code is rendered right at the place where we had defined the wrapper in our source code. This works fine as long as the Jquery and Kendo script references are done at the head level of the document. In next section we will see what happens when we move the script reference to the end of the page. Luckily, Kendo UI Wrappers have a answer to the initialization scenario we saw in the previous section. Each of the widget wrappers expose a method called Deferred(). It’s a fluent method and will suppress immediate script statement rendering. The next question we may have is – we deferred the initialization, but how do we initialize the widget once page is loaded. Answer is, Kendo wrappers expose one more fluent method called DeferredScripts(). DeferredScripts method will output all the previously deferred initialization statements. First, I moved the Jquery and Kendo script reference to end of the page and made a call to RenderSection. This is the section where we will out put the initialization scripts from the pages. Second, I have called the Deferred() fluent method on the auto complete wrapper. Declared a section PageScripts and called DeferredScripts() fluent method to output the deferred statements. When using Kendo UI ASP.NET MVC wrappers, you should pay attention to how you want to use the widgets. Since the wrappers output the initialization statements immediately at the position of the wrappers definition, it needs the JQuery and kendo scripts to be available upfront. If you follow the best practice of loading the scripts at the end of the page, you will need to defer the initialization statement and manually output all deferred statements after you have loaded the JQuery and Kendo scripts. This blog post introduces you to Deferred() and DeferredScripts() fluent method supported in Kendo. Hope this information is useful to you. If you have not experienced Kendo UI, encourage you to visit www.kendoui.com and take a look at our demos. 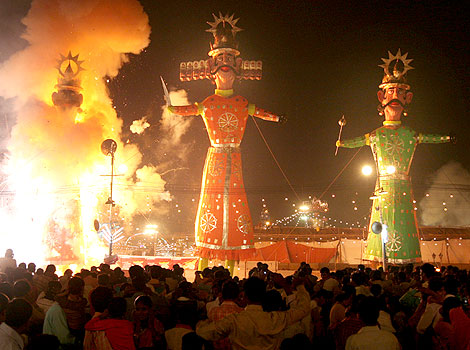 For Indians worldwide, the Holiday season is about to start with the harbinger of festivals – Dusshera round the corner. As the time for revelry draws closer, Telerik India is here to keep you stay updated with the latest from the world of software development. Sometimes, we feel that Dusshera is just an excuse to start the party earlier than the rest of the world! The party continues with Telerik as we continue to hand out T-shirts to select few attendees from every webinar. We would love to see you at our booth if you are attending any of the above conferences!